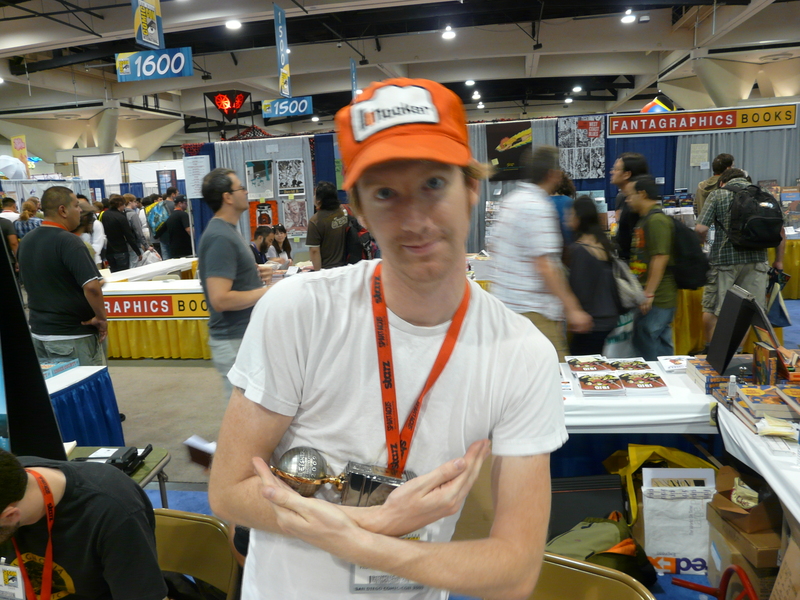 I bought FAR ARDEN at San Diego Comic Con 2009 (FYI – a lot of my blogs will start out this way). Top Shelf, as a publisher, has some AMAZING authors that they are happy and eager to promote when you stop at their booth. And most often you get to meet and talk one-on-one with the authors as they explain how their books came to be. We got to meet Kevin Cannon the day before he won his Eisner Award for another story (Swallow Me Whole). He was very excited, nervous AND appreciative of the nomination. The following day we went back again to congratulate him – obviously still high on his win from the night before (seen here cradling his Award)! We happily bought his newest book – with signature and drawing – and added it to the stack of treasures from that year. I wasn’t sure what to make of the story by thumbing through the pages or by reading the quick bio : Meet Army Shanks — crusty old sea dog and legendary brawler of the high Arctic seas! Hmmm… not really my usual cup-of-tea, but … what the hell, right?! Um…WOW! By the time I closed the book I knew EXACTLY why Kevin Cannon won the award. The story is quirky, funny, a little sad and in the end has a twist that I NEVER saw coming! And for a 400+ page book it is a VERY easy, quick read. Follow the link below to buy the book – SUPPORT A LESSOR KNOWN ARTIST with a GREAT publisher… you’ll be glad you did!